Do you ever feel worse in the winter than you do in the summer? A deficiency in Vitamin D and a certain spectrum of light may hold the key to feeling better. Autoimmune conditions are more likely to cluster in regions farther from the equator. Scientists have suggested that one of the potential reasons for this may be due to to inadequate Vitamin D levels, as Vitamin D is primarily absorbed via sunshine on skin that is free of sunscreen. Although those who live in warm climates are more likely to be absorbing enough of the sunshine vitamin, I often find that even people who live in warm climates such as Southern California, Florida and Arizona are Vitamin D deficient at similar rates to people living in Wisconsin or Minnesota! This is because our absorption of the vitamin from food is minimal, and is often further compromised by digestive enzyme deficiencies and conditions that lead to malabsorption of nutrients like SIBO. As a result, it is one of the most under-recognized deficiencies in our society, and an estimated 85 percent of Americans may be deficient in it. Vitamin D affects about 3,000–30,000 genes in our bodies. You may know that it’s necessary for helping your body to absorb calcium and strengthen your bones, but it also plays an important role in your immune system health. Vitamin D may prevent and modulate autoimmunity, while a deficiency in Vitamin D is associated with improper immune function. Many diseases have also been connected to low Vitamin D levels, including heart disease, autoimmune disease, depression, and recently, thyroid conditions, including Hashimoto’s. Optimizing your levels of this important nutrient may be a key part of the puzzle of restoring your health. Vitamin D and Epstein-Barr Virus – what’s the connection? Can blue light therapy be beneficial for the immune system? The role of Vitamin D in the health of the human body has been well described by researchers and the medical community alike. Recent studies have shown that serum Vitamin D levels can be directly correlated with human life expectancy. Dr. William Grant, Ph.D., a Vitamin D expert, has proposed that raising the optimal serum Vitamin D level would prevent 30 percent of cancer deaths each year. Numerous studies have connected low Vitamin D levels to various autoimmune conditions. For example, a deficiency in Vitamin D has been correlated with higher rates of type 1 diabetes. In Finland, the incidence of type 1 diabetes in Finnish children increased when the daily recommended dosage of Vitamin D was reduced from 4000-5000 IU in 1964 to 400 IU in 1992; but incidences of diabetes in children have been decreasing since 2006, the year Finland decided to fortify all dietary milk products with Vitamin D3. Vitamin D may be beneficial in balancing the immune system through supporting the production of T-regulatory cells, and suppressing the Epstein-Barr Virus, a virus that has been tied to numerous autoimmune conditions, including Hashimoto’s. Research has also shown that Vitamin D actively prevents the development of autoimmunity in animal models. 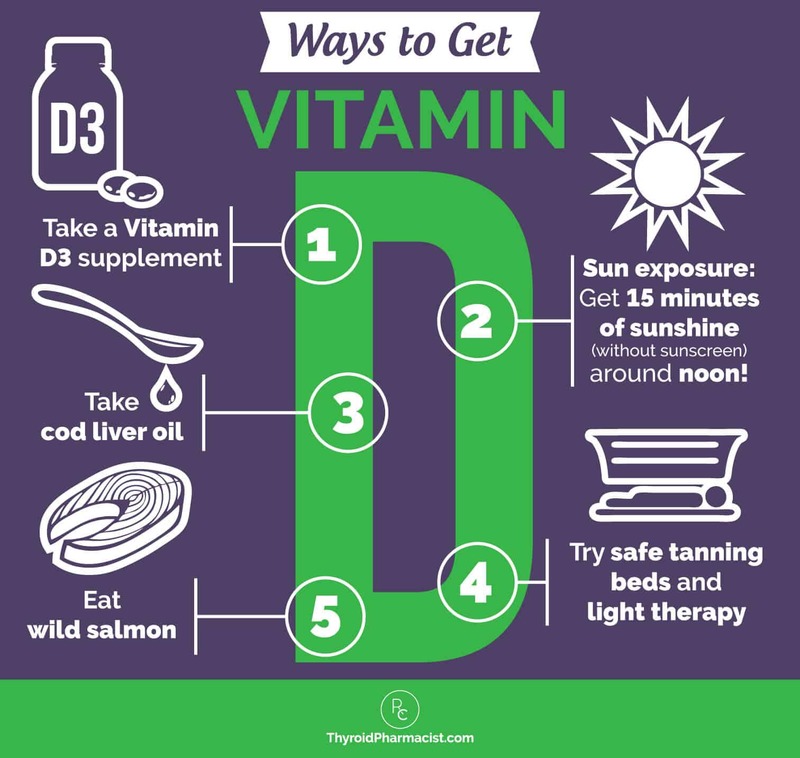 There is also a strong connection between Vitamin D deficiency and various thyroid conditions. Vitamin D deficiency has been documented in Hashimoto’s, Graves’ disease, thyroid cancer, as well as postpartum thyroiditis. One study in Turkey found that 92 percent of Hashimoto’s patients were deficient in Vitamin D! In 2015, I surveyed 2332 of my readers with Hashimoto’s, and found that 68 percent of them reported also being diagnosed with Vitamin D deficiency. Studies have also found Vitamin D reduces thyroid antibodies (TPO antibodies as well as TG antibodies) in those taking levothyroxine, as well as in people who have “euthyroid” Hashimoto’s, where their TSH is still normal, but they have elevated thyroid antibodies. A Greek study reported about a 20 percent overall decrease in thyroid antibodies with Vitamin D supplementation. Researchers have suggested that Vitamin D can slow down and prevent the progression of Hashimoto’s. Who’s at Risk for Deficiency? As skin cancer awareness and the use of sunscreen has become more widespread, people are not getting the appropriate amount of Vitamin D in the summertime. In fact, a clinical review published in The Journal of the American Osteopathic Association found that nearly 1 billion people worldwide may have insufficient levels of Vitamin D related to sunscreen use. The study also found that Vitamin D deficiency can be more prevalent in certain populations due to differences in skin pigmentation. For example, 95 percent of African American adults may have Vitamin D deficiency. Furthermore, those living in northern climates are especially at risk for Vitamin D deficiency in the colder months, when the body is covered up. However, even those living in warm countries may be at risk for low Vitamin D levels. According to a Spanish study, although Spain receives sufficient sunlight radiation, it is difficult for its population to attain the recommended daily dose of Vitamin D in the winter, as sunlight exposure is affected by Spain’s northern latitude. The study also noted that absorption could depend on the time of day and the position of the sun. At 10 am, almost 10 hours would be required to get enough Vitamin D — but most people do not get 10 hours of sunshine, and if they did, that would be excessive exposure! Furthermore, although avoiding prolonged sun exposure helps prevent skin cancer, not spending time outside on a daily basis can also result in being at risk of having insufficient Vitamin D levels. As such, Vitamin D deficiency is very common. You may be wondering, how much Vitamin D does your body need? While the conventional reference ranges define Vitamin D deficiency as under 30 ng/mL, Vitamin D levels should be between 60 and 80 ng/mL for optimal thyroid receptor and immune system function. Vitamin D2 (ergocalciferol) – This form is found in some fortified foods and certain supplements. Vitamin D3 (cholecalciferol) – This is the most biologically active form and is found in some high-quality supplements. Vitamin D2 and D3 can both be converted by the liver and the kidney into the active form 1,25-dihydroxyvitamin D.
There are two available tests to check your Vitamin D levels: 1,25 (OH)D and 25(OH)D. The test 25(OH)D, also called 25-hydroxyvitamin D, is preferred, as it tests for both Vitamin D2 and D3 levels. If you have Hashimoto’s and have not had your Vitamin D levels checked, I recommend testing ASAP. When supplementing, I recommend testing every 3-6 months to ensure you are getting adequate amounts, and then testing again in the winter season. Vitamin D levels should be checked at regular intervals, especially in the winter seasons. Studies are now suggesting that much higher doses of Vitamin D than the original recommended daily allowance of 400 IU per day should be taken. In fact, some studies show that 25(OH)D levels under 75 nmol/L may be too low for safety and are associated with higher all-cause mortality. Moreover, one study found that an intake of 6201 IU was needed to achieve the Endocrine Society’s recommendation of serum 25(OH)D values at 75 nmol/L. Furthermore, I believe that Vitamin D is especially important for people who have had a prior Epstein-Barr infection, as the CD8+ T cells that fight the virus are Vitamin D dependent. So how can we get adequate amounts of Vitamin D? Vitamin D can be produced in the skin when exposed to sunlight, or it can be ingested from foods and supplements. Your Prescription? A Beach Vacation! You could say that boosting your Vitamin D levels can be a “walk in the park”. 🙂 Vitamin D advocates recommend 15 minutes of unexposed skin without sunscreen around noon. Perhaps you can consider going for a walk during lunchtime? If you are fair skinned and not used to the sun, you may need to start slower. Be careful not to overexpose yourself to prevent getting a sunburn. However, some health care professionals suggested that in severe deficiency, getting adequate Vitamin D levels would require you to spend four to six hours exposed on a sunny beach for seven days straight. Sounds awful, right? Unless you have a beach vacation planned (bring me? ), tanning beds are also a great (and relaxing) option. (Yes, I said tanning beds!). We can also get Vitamin D from food. Dietary sources of Vitamin D include: wild salmon (800 IU per 3.5 oz of D3) cod liver oil (700 IU per teaspoon), fish, fortified dairy and orange juice, and eggs. However, the amount of Vitamin D we absorb from food is limited, and people with fat malabsorption, food sensitivities and other digestive issues common in Hashimoto’s may be further impaired in their ability to absorb Vitamin D from foods. This is why supplementation can be incredibly helpful and why I recommend Vitamin D supplements for most people with Hashimoto’s. My first option for my Vitamin D deficient clients is of course a beach vacation, and my husband usually obliges to my insistence that we go somewhere warm each winter, so we can sit on the beach and increase our levels of life-saving Vitamin D.
But I know that going to the beach is not always possible and realistic for everyone… So, my second best option would be to take an oral Vitamin D3 supplement*. As the recommended daily allowance of 400 IU of Vitamin D has been shown to be inadequate for most people, I generally recommend 5,000 IU per day as a starting point for my clients with Hashimoto’s. Taking your Vitamin D supplements with a meal can be helpful in increasing its absorption by 30-50 percent. However, I also recommend monitoring Vitamin D levels to ensure that the person is within the optimal range (60 to 80 ng/mL for optimal thyroid receptor and immune system function). Please note: in my experience of performing case reviews for people with Hashimoto’s, Vitamin D is the most common deficiency followed by ferritin. However, as Vitamin D excess can be problematic, I always recommend testing for these nutrients before supplementing. Some people with Hashimoto’s may also be deficient in Vitamin K, especially when they have issues with fat malabsorption. Vitamin K deficiency is not routinely tested, but symptoms may include easy bruising, excess bleeding and heavy menstrual periods. Supplementing with Vitamin D when one is deficient in Vitamin K can have a negative impact on our arteries. Vitamin D supplements liberate calcium from our bodies, and in the case of Vitamin K deficiency, the calcium may go to our arteries instead of our bones. Adequate Vitamin K can prevent arterial calcification and encourage getting more calcium to the bones, which is beneficial in osteoporosis, a common condition seen in people with Hashimoto’s. *Please note, soybean peptone is used as a raw material in the fermentation process for the vitamin K2. The finished vitamin K2 is tested for contamination of soy protein and contains less than 10 ppm (parts per million). If you do not tolerate soy, you may want to opt for the Pure Encapsulations version, without vitamin K, instead. Additionally, Vitamin K supplements are generally safe and well tolerated, but if you take blood thinning medications like warfarin, speak to your doctor or pharmacist before starting a supplement that contains Vitamin K.
If you happen to feel worse in the winter than you do in the summer (and especially if you have the winter blues), Vitamin D may help, but you would likely have the best outcomes if you combined it with blue light therapy. A recent study published in Scientific Report suggests that exposure to sunlight may be beneficial to our immune system via mechanisms that are separate from Vitamin D. The researchers noted that blue light in particular, which is produced naturally by the sun, may activate key immune cells and boost immune function. In their study, blue light exposure triggered the synthesis of hydrogen peroxide, which inactivated pathways that signaled an increase of motility of the T cells (which play a role in mounting an immune response against infections) in both mouse and human T lymphocytes. Blue light is known to reach the second layer of the skin, where there is a higher concentration of T lymphocytes compared to those found in the bloodstream. The study, therefore, suggests that there could be a separate pathway through which sunlight — specifically blue light exposure — may boost the immune system. Blue light therapy devices have also been studied in seasonal affective disorder (SAD), aka “the winter blues”, with great success. I like this blue light therapy device to reap the benefits of blue light exposure anytime, from the comfort of my home, without having to wait for the weatherman to announce a sunny day. It’s also great to have around during the winter. While I recommend using it for about 15 minutes a day, you can set the timer according to your needs. This light therapy can also be really helpful if you have trouble waking up in the mornings. I recommend keeping it at your bedside and turning it on when you wake up, or keeping it in your bathroom and turning it on while you get ready. The little blue light therapy device has helped me through many dark winters in Chicago, cloudy days in Amsterdam, and long Colorado winters. Vitamin D has been helpful in my recovery, and I’ve found that exposure to sunshine, Vitamin D supplements, and blue light therapy are strategies that consistently make my clients and readers feel better. In my survey of 2232 people with Hashimoto’s, 67 percent of my readers reported their fatigue improved and said they felt significantly better after taking a Vitamin D supplement. Improvements in mood, pain reduction, as well as a reduction in antibody titers is also something I’ve seen time and time again. Because of the prevalence of Vitamin D deficiency in Hashimoto’s, and due to its known connection to autoimmune disease in general, I’ve recommended Vitamin D testing and supplementing to my readers and clients since 2013. I have noticed that the people who are struggling often have Vitamin D deficiency, and those who feel their best and/or who are in remission from Hashimoto’s, tend to have Vitamin D levels between 60-80 ng/mL. While it’s not a magic bullet, optimizing Vitamin D levels can be a really simple and inexpensive way to feel better and address the immune system. P.S. Looking to start your thyroid journey? You can download a free Thyroid Diet Guide, 10 Thyroid Friendly Recipes, and the Nutrient Depletions and Digestion Chapter from my Root Cause book for free by going to www.thyroidpharmacist.com/gift. You will also receive occasional updates about new research, resources, giveaways and helpful information. For future updates, make sure to follow us on Facebook too. If you’re curious about other vitamin deficiencies and symptoms related to them, you can download my FREE Supplements to Subdue Symptoms eBook! Tamer G, Arik S, Tamer I, Coksert D. Relative vitamin D insufficiency in Hashimoto’s thyroiditis. Thyroid. 2011;21(8):891-896. doi:10.1089/thy.2009.0200. Wang J, Lv S, Chen G, et al. Meta-analysis of the association between vitamin D and autoimmune thyroid disease. Nutrients. 2015;7(4):2485-2498. doi:10.3390/nu7042485. Vahabi P, Aminorroaya A, Amini M, et al. Effect of Vitamin D deficiency treatment on thyroid function and autoimmunity markers in Hashimoto’s thyroiditis: A double-blind randomized placebo-controlled clinical trial. Journal of Research in Medical Sciences : The Official Journal of Isfahan University of Medical Sciences. 2017;22:103. doi:10.4103/jrms.JRMS_1048_16. Papadimitriou DT. The Big Vitamin D Mistake. Journal of Preventive Medicine and Public Health. 2017;50(4):278-281. doi:10.3961/jpmph.16.111. Some Benefits of Sunlight May Be Independent of Vitamin D. Medscape.com. https://www.medscape.com/viewarticle/874371. Published January 18, 2017. Accessed January 23, 2018. Pfotenhauer K, Shubrook J. Vitamin D Deficiency, Its Role in Health and Disease, and Current Supplementation Recommendations. J Am Osteopath Assoc. 2017;117(5), 301-305. Baker T. Vitamin D insufficiency, low rate of DNA methylation in black teens may increase disease risk. Medical College of Georgia at Augusta University and ScienceDaily. www.sciencedaily.com/releases/2016/04/160425143108.htm. Published April 25, 2016. Accessed January 18, 2018. Smith E, Frankenburg E, Goldstein S, Koshizuka K, Elstner E, Said J, et al. Effects of long-term administration of vitamin D3 analogs to mice. Journal of endocrinology. 2010;165(1):163-172. Baeke F, Takiishi T, Korf H, Gysemans C, Mathieu C. Vitamin D: modulator of the immune system. Current opinion in pharmacology. 2010;10(4):482-496. Strieder T, Prummel M, Tijssen J, Endert E, Wiersinga W. Risk factors for and prevalence of thyroid disorders in a cross‐sectional study among healthy female relatives of patients with autoimmune thyroid disease. Clinical endocrinology, 2003;59(3):396-401. Krysiak R, Szkróbka W, Okopień B. Moderate-dose simvastatin therapy potentiates the effect of vitamin D on thyroid autoimmunity in levothyroxine-treated women with Hashimoto’s thyroiditis and vitamin D insufficiency. Pharmacol Rep. 2018;70(1):93-97. doi: 10.1016/j.pharep.2017.07.019. Krysiak R, Szkróbka W, Okopień B. The Effect of Vitamin D on Thyroid Autoimmunity in Levothyroxine-Treated Women with Hashimoto’s Thyroiditis and Normal Vitamin D Status. Exp Clin Endocrinol Diabetes. 2017;125(4):229-233. doi: 10.1055/s-0042-123038. Ucan B, Sahin M, Sayki Arslan M, Colak Bozkurt N, Kizilgul M, Güngünes A, et al. Vitamin D Treatment in Patients with Hashimoto’s Thyroiditis may Decrease the Development of Hypothyroidism. Int J Vitam Nutr Res. 2017;12:1-9. doi: 10.1024/0300-9831/a000269. Kim D. The Role of Vitamin D in Thyroid Diseases. Int J Mol Sci. 2017;18(9). pii: E1949. doi: 10.3390/ijms18091949. Ke W, Sun T, Zhang Y, He L, Wu Q, Liu J, et al. 25-Hydroxyvitamin D serum level in Hashimoto’s thyroiditis, but not Graves’ disease is relatively deficient. Endocr J. 2017;64(6):581-587. doi: 10.1507/endocrj.EJ16-0547. Liontiris MI, Mazokopakis EE. A concise review of Hashimoto thyroiditis (HT) and the importance of iodine, selenium, vitamin D and gluten on the autoimmunity and dietary management of HT patients. Points that need more investigation. Hell J Nucl Med. 2017;20(1):51-56. doi: 10.1967/s002449910507. Altieri B, Muscogiuri G, Barrea L, Mathieu C, Vallone CV, Mascitelli L, et al. Does vitamin D play a role in autoimmune endocrine disorders? A proof of concept. Rev Endocr Metab Disord. 2017;18(3):335-346. doi: 10.1007/s11154-016-9405-9. Kim D. Low vitamin D status is associated with hypothyroid Hashimoto’s thyroiditis. Hormones (Athens). 2016;15(3):385-393. doi: 10.14310/horm.2002.1681. Maciejewski A, Wójcicka M, Roszak M, Losy J, Łącka K. Assessment of Vitamin D Level in Autoimmune Thyroiditis Patients and a Control Group in the Polish Population. Adv Clin Exp Med. 2015;24(5):801-6. doi: 10.17219/acem/29183. Mazokopakis EE, Papadomanolaki MG, Tsekouras KC, Evangelopoulos AD, Kotsiris DA, Tzortzinis AA. Is vitamin D related to pathogenesis and treatment of Hashimoto’s thyroiditis? Hell J Nucl Med. 2015;18(3):222-7. Ma J, Wu D, Li C, Fan C, Chao N, Liu J, et al. Lower Serum 25-Hydroxyvitamin D Level is Associated With 3 Types of Autoimmune Thyroid Diseases. Medicine (Baltimore). 2015;94(39):e1639. doi: 10.1097/MD.0000000000001639. Office of Dietary Supplements. Vitamin K – Health Professional Fact Sheet. National Institutes of Health. https://ods.od.nih.gov/factsheets/VitaminK-HealthProfessional/. Updated March 2, 2018. Accessed March 13, 2018.
van Ballegooijen AJ, Pilz S, Tomaschitz A, Grübler MR, Verheyen N. The Synergistic Interplay between Vitamins D and K for Bone and Cardiovascular Health: A Narrative Review. Int J Endocrinol. 2017;2017:7454376. doi: 10.1155/2017/7454376. Gouni-Berthold I, Krone W, Berthold HK. Vitamin D and cardiovascular disease. Curr Vasc Pharmacol. 2009;7(3):414-22. Iwamoto J, Yeh JK, Takeda T, Ichimura S, Sato Y. Comparative effects of vitamin K and vitamin D supplementation on prevention of osteopenia in calcium-deficient young rats. Bone. 2003;33(4):557-66. Braam LA, Hoeks AP, Brouns F, Hamulyák K, Gerichhausen MJ, Vermeer C. Beneficial effects of vitamins D and K on the elastic properties of the vessel wall in postmenopausal women: a follow-up study. Thromb Haemost. 2004;91(2):373-80. Wallin R, Wajih N, Greenwood GT, Sane DC. Arterial calcification: a review of mechanisms, animal models, and the prospects for therapy. Med Res Rev. 2001;21(4):274-301. Sokoll LJ, Booth LS, Davidson KW, Dalla GE, Sadowski. Diurnal variation in total and undercarboxylated osteocalcin: influence of increased dietary phylloquinone. Calcif tissue Int. 1998;62(5):447-52. Howland RH. An overview of seasonal affective disorder and its treatment options. Phys Sportsmed. 2009;37(4):104-15. doi: 10.3810/psm.2009.12.1748. Your comments about EBV inhibiting vitD uptake are very interesting. I have been supplementing with 6000ius of D3 for years and get 20-30mins of sun exposure per day at midday. But to no avail, my D levels to do not respond. I’ve been researching the reasons for malabsorption syndrome eg. pancreatic insufficiency, celiac disease, hepatic or kidney disease and prolonged use of medications such as antifungals, antiseizure drugs, cholestyramine and glucocorticoids. But I didn’t know that EBV could be a reason. I had EBV 23 years ago, Dr Wentz, do you think EBV can reoccur? And if I have the antibodies for it, how do I test for EBV? EBV is Epstein Barr Virus. Mary- Without going into too much detail, the first of the crucial defining moments in my disease development may have started during my undergraduate studies at the University of Illinois. Due to the communal living setting of dormitories (and less than stellar hygiene habits of most college students) I had recurrent strep throat infections and even contracted mononucleosis, a viral infection caused by the Epstein-Barr Virus (EBV), which is implicated in triggering many autoimmune conditions. I received multiple courses of antibiotics as well as flu shots (which may be associated with EBV infections), and started birth control for menstrual cramps. Are there foods that inhibit D uptake? My D levels are at 26 and I got a lot of sun this summer versus last year my D was 37 after spending 8 months in rainy London. I’m baffled. Suggestions on what to look into? I also can’t hold iron. Pernicious anemia with really low ferritin levels. Are these related? Hi Adrienne, I once read that in someone with Vitamin D levels that low, you would have to spend 2-4 hours, 5 days a week in the sun to get them to target. Talk to your doctor about a Vitamin D supplement of at 5-10K IU . Absorption issues may cause you a great difficulty in absorbing iron and Vitamin D from foods. You may have a gut infection, lack of a digestive enzymes, nutrient deficiency or food sensitivity or combo of all of the above that is contributing to impaired absorption of nutrients. Hope that you will take a look at my book. I think it will help you. Wishing you all the best! Oops, hit “reply” prematurely, please pardon the typos! Please explain what you mean by a “safe” tanning bed? I am vitamin D deficient and having trouble raising my level with supplements. Adeline- The best way to restore optimal vitamin D level is through sun exposure, safe tanning beds, and an oral vitamin D3 supplement. The secondary best sources of vitamin D are from foods like wild salmon (800 IU/3.5 oz of D3); and cod liver oil (700 IU per teaspoon). 6 months since Diagnosis of Hashimotos, 6 months of Autoimmune Diet and P.E. Vitamin D3 supplementation (2000 iu) and NO improvement in 25(OH)D levels, stuck at 25. It seems like I’m wasting money on supplements and the special diet while trading weight loss (the only positive result) for TPO increase. 56% higher today than last November. Currently at 542 with an increasing upward trajectory. What can I do? What are the symptoms of high Vit d levels? 50k a month w/3k daily. Original level 25. Debrah- I highly recommend that you work with a functional medicine clinician. It’s a whole medical specialty dedicated to finding and treating underlying causes and prevention of serious chronic disease rather than disease symptoms. Is 15 minutes of exposure to sunlight the daily limit or is the exposure limit within 48 hours or even a second exposure after several hours on the same day? Terence- Vitamin D advocates recommend 15 minutes of unexposed skin without sunscreen around noon. Perhaps you can go for a walk during lunchtime? If you are fair skinned and not used to the sun, you may need to start slower. Be careful not to overexpose yourself to prevent getting a sunburn. i want to report back that 4 weeks of sunshine raised my d3 in my blood for 25%…..i did no oral supplementing, since i had that problem with sensitive moles…and still did not figure out why it happens, i searched in the studies so much but nothing i could dig up…..the only thing i did dig up is that there are naked mole rats that have 0 d vitamin, and no cancer at all! and live long about 30 years!…..vitamin D is just like thyroid having receptors in every cell, and having prohormone and hormon…..so there must be some special role of that vitamin…so i wonder how it all functions…..and this thing that my moles get sensitive to oral supplementing d3 is so strange….and may be a clue to something? I was diagnosed with Graves’ disease in 1991. Had thyroidectomy in 1993. Biopsy was done, papillary carcinoma. Was treated with I 131 in 1993 and 1995, when thyroid uptake and scan showed another hot spot. Been on same dose for years, they keep me on the hyperthyroid side to suppress Cancer from returning. I have leg cramps a lot. Magnesium helps, have some bowel issues; but no fatigue or weight problems. I am vitamin D def and take 2,000 U of Vit D 3 but my level never gets above 32. How much should I take. Also take vitamin B 12 500 mcg daily. Kathleen- I can’t make any direct medical recommendations to any single person for legal reasons. I recommend that you find a doctor that will let you be a part of your healthcare team! Most thyroid conditions result from the immune system attacking the thyroid because the immune system is out of balance. Even when the thyroid is taken out surgically, is ‘dead’, or treated with radioactive iodine the autoimmunity still persists in most cases. Many people will have their thyroids removed, and will develop new autoimmune disorders such as Lupus, Rheumatoid arthritis, etc. The immune system just finds a different target. We need to re-balance the immune system to prevent this (sometimes the autoimmunity can be reversed as well). The gut determines your immune system. With the exception of discussing proper thyroid medication dosing, the majority of my website and my book focuses on balancing the immune system. The info I present is based on my own research and journey for overcoming my autoimmune thyroid condition. This blog is profoundly helpful. THANK YOU SO MUCH!! I bought your book Izabella and will now return to reading it again….as have been quite overwhelmed and focused on another of my autoimmunities. So it seems infection, gut dysbiosis, vitamin and mineral deficiency, intestinal permeability, enzyme insufficiency are all factors? What about hormonal issues? I was wondering whether you might possibly have devised a comprehensive list of all the contributory factors? Or does this keep growing? My vitamin D is at 15, my doctor put me on 50,000 once a week. Any other suggestions? Caroline- Thyroid tissue can regenerate, but the rate at which it does is not always predictable. Thus, some are able to stop the autoimmune attack on their thyroid and regain normal thyroid function. Others can reduce the dose of medications, and others will need to stay on the medications indefinitely. I’m currently working on some protocols to help with tissue regeneration. When diagnosed with breast cancer nearly 5 years ago my D was at 8. 50,000 IU vitamin D3 1 time weekly got it to 39 eventually. I get occasional testing at my own request. At last Onc visit they forgot to do. This is not universally taken seriously. I am usually low but docs want you to take daily OTC. Does not work as well. Hi Isabella, how do I purchase your book? Is it on amazon? What is a “safe tanning bed” and how do I find one? Suzi- As skin cancer awareness, be careful not to overexpose yourself to prevent getting a sunburn. curious what is considered a “safe tanning bed” also. Hayley- As skin cancer awareness, be careful not to overexpose yourself to prevent getting a sunburn. I’m also curious about the “safe tanning bed”. Can you please clarify? Thank you! Dmg- As skin cancer awareness and the use of sunscreen has become more widespread, you just want to be aware of how much you are exposed to. Be careful not to overexpose yourself to prevent getting a sunburn. My vitamin D is 5.6. Dr. Is putting me on 10,000 and then 15,000 alternating days. I hope that helps. Elizabeth- I look forward to hearing your progress on this page! Thyroid tissue can regenerate, but the rate at which it does is not always predictable. Thus, some are able to stop the autoimmune attack on their thyroid and regain normal thyroid function. Others can reduce the dose of medications, and others will need to stay on the medications indefinitely. I’m currently working on some protocols to help with tissue regeneration. i have an allergy to the sun and have graves treated with ri and on sup thyroid…what then? Georgette- Sources of vitamin D include : cod liver oil, fish, fortified dairy and orange juice, eggs, and most importantly, sunlight.Graves and Hashimoto’s are both autoimmune conditions that affect the thyroid. They are thought to be closely related. Sometimes one turns into the other. The difference is the site of the antibody attack. In Hashimoto’s, the antibodies are found to thyroglobulin (in 80%) and thyroid peroxidase (TPO) enzyme (in 95% of people)-Hashimoto’s results in hypothyroidism and is usually treated with Synthroid and replacement hormone. Dr recommending Synthroid low dose for me. My number was 4.2 in July and today 6.2. Do I have to take meds? Estelle- There are quite a few options for thyroid medications. In my experience, what works for one person may not work for another. If your doctor will not prescribe the medication you are looking for, ask your local pharmacist for doctors in your area who prescribe the medication you are looking to try. Have you read these articles? So, I have been on the very high dosages of Vit D as you suggest, and my lab levels have gone up. However, I don’t know that I “feel” the relief I am expecting? Recently, I found information from Dr Robbins on gotmag.org, and he asserts that Vit D deficiency is actually a magnesium deficiency (I think that is what he is saying). He recommends getting the the Vitamin D, 1, 25-dihydroxy test, rather than just getting the Vitamin D, 25-dihydroxy. I’m not trying to pit “doctor against doctor”… I’m just someone trying to figure this all out, and trying to get varying opinions and perspectives. 🙂 Thank you so much for sharing your knowledge! Beth – thank you for following this page. I highly recommend that you work with a functional medicine clinician. It’s a whole medical specialty dedicated to finding and treating underlying causes and prevention of serious chronic disease rather than disease symptoms. Hi Izabella, Just got your book and it’s so informative, thank you! I have recently been diagnised with Hashimoto’s (stage 2 according to your book I think) and I have recently started taking Vitamin D3 with K added in drops as my blood test came back borderline low. However, I also did a hair mineral analysis recently which showed a high calcium to potassium level with very low boron. Mr google says that taking vitamin D3 can be harmful in such a case as it may drive calcium up even more and lower potassium. Is this your opinion? Should I stop taking the vitamin D and get in th sun instead? I have to say I have been feeling worse symptoms since I started the D3. Also is there a way to reduce my calcium levels and bring up the potassium? Thank you so much for all your amazing work and info. I feel like I’m finally figuring out my health because of it. Jenny – thank you for your support! I’m looking forward to seeing your progress on this page. Please, understand that due to liability issues, I am unable to answer specific medical questions, but I highly recommend that you work with a functional medicine clinician. It’s an entire medical specialty dedicated to finding and treating underlying causes and prevention of serious chronic disease rather than disease symptoms. Jenny – Thank you for following this page. Please, understand that due to liability issues, I am unable to answer specific medical questions, but I highly recommend that you work with a functional medicine clinician. It’s an entire medical specialty dedicated to finding and treating underlying causes and prevention of serious chronic disease rather than disease symptoms. Viktoriya – thank you for following this page. My heart goes out to you and your daughters. <3 For children, teens, (and adults), I always recommend starting with the diet. Are they gluten, dairy, corn and soy free? Are they eating a nutrient dense diet with fermented foods? Implementing those changes can help many symptoms. For example, some cases of anemia can be helped by eating liver, others may resolve by going gluten free. Acid reflux is often caused by food sensitivities. Most of the interventions recommended in my book can be done with children, with the exception of the dosing of supplements. I do suggest that you work with a functional medicine doctor that is familiar in working with children (I only works with adults). I hope this helps! I live in Minnesota and I’ve been low on vitamin D for years. I was on 50,000 IU of D2 a week for years. After finding out I had hashimoto’s and learning about it’s link to hair loss, I switched to a D3 supplement and increased my dose. I take 5,000 IU the times a day and I’m STILL in the low range. My doctor doesn’t understand why I don’t absorb it, so she’s investigating possible reasons. I’ve never been a fan of summer so I don’t go outside often unless it’s 70 degrees or less. The thoughtof being our the on heat and humidity… blech. That’s three times a day that I take 5,000 IU. Louise – thank you for sharing! I highly recommend that you work with a functional medicine clinician to be a part of your own health care team. It’s an entire medical specialty dedicated to finding and treating underlying root causes and prevent serious chronic disease rather than treating individual disease symptoms. I think it is important that you clarify that it is vit K2, and not just “vit K”, the one involved in the release and deposition of Calcium in the body. Also it would have to be done in conjunction with VitA, to be precise. It is a triade. Also, VitD can be consumed safely to higher doses. 20,000 IU is not that “crazy number”. If I recall correctly, around 90K UI would begin to be a “too much number”. But you area right that caution is advised. I wonder if its a chicken and egg scenario. I lived in Dubai, the desert!, for 9 years and was still hugely Vitamin D deficient. I have hashimotos. wondering if the autoimmmune disease caused the deficiency vs the other way around. same with intestinal permeability. a study on rats recently found that the leaky gut was a byproduct of autoimmunity. Hi, I spent four months in Hawaii then back in the North. Three montjs later my D is 32. I have IBS and slight pernicious anemia without any other “official” deficiency. So it looks like sunshine did not do it for me. However, I started to feel much better when I take 1 tablespoon fish oil a day. How much Vit K would you recommend? Suzanne – thank you for sharing! I wish I could give you more direct advice but, each person will react differently. I would advise you to ask your personal pharmacist or a trusted clinician who’s care you are under. I am not able to respond directly to these types of questions here. I also don’t recommend starting multiple supplements all at once. I recommend starting one at a time, and then adding another a week or so later once it has been confirmed that the first supplement is not causing any harm. Greetings from Romania! 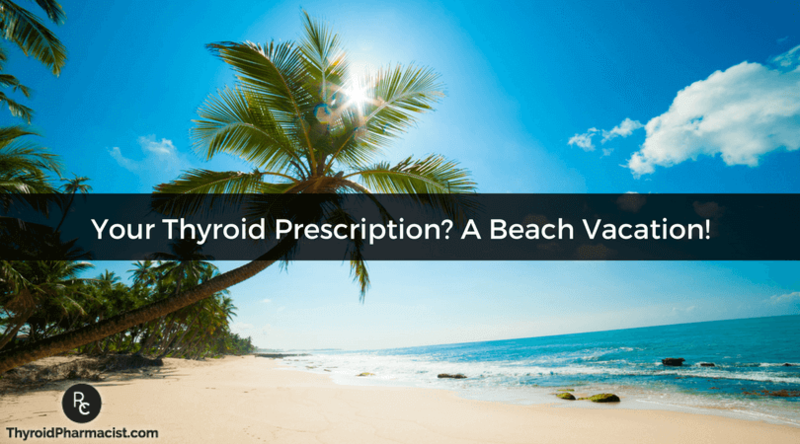 I have an autoimmune thyroiditis and I can not stand the sun, heat, suffocate, my thyroid hurts, it swells, faint, I do not go to the beach, to the sea. Winter, I’m cold very cold, it hurts my heart, it fails, it stops breathing, my hands are frozen in gloves, I can not move them. What to do? My doctor prescribed euthyrox 25 ug and selenium. Thank you. You’re wonderful, the best specialist. Alexandra – thank you for reaching out. People with Hashimoto’s may experience BOTH hypothyroid and hyperthyroid symptoms because as the thyroid cells are destroyed, stored hormones are released into the circulation causing a toxic level of thyroid hormone in the body, also known as thyrotoxicosis or Hashitoxicosis. Eventually, the stored thyroid may become depleted and due to thyroid cell damage, the person is no longer able to produce enough hormones. At this time, hypothyroidism develops. Here are some articles you might find helpful. I totally agree with using a tanning bed to feel better. At the time when I used them, I wasn’t aware I had Hashimoto’s, and really didn’t think about Vitamin D, I just knew it made me feel better. It wasn’t even the tan that made me feel better, it was just a deep healthy feeling. I can’t explain it much better than that. I know now it was probably the Vitamin D, and so as soon as I can I’m going to get my tanning bed hooked back up! I do get outside a lot in the spring and fall, (can’t really tolerate the summer heat) I do have heat intolerance, and have been hospitalized with dehydration/thyroid storm. Nutritional deficiencies, not enough water, etc. along with the Hashimoto’s caused this I’m assuming, although at that time the doctor’s said I had hyperthyroidism. I go to a naturopath now, and have been diagnosed with Hashimoto’s. Gaye – thank you for sharing your journey. <3 Graves and Hashimoto's are both autoimmune conditions that affect the thyroid. They are thought to be closely related. Sometimes one turns into the other. The difference is the site of the antibody attack. In Hashimoto's, the antibodies are found to thyroglobulin (in 80%) and thyroid peroxidase (TPO) enzyme (in 95% of people)-Hashimoto's results in hypothyroidism and is usually treated with Synthroid and replacement hormone. I ordered numerous helpful tests by convincing my endo and my primary i need to find the root cause of my symptoms and the info I’ve learned from you has really helped a lot! I uncovered sublclinial hypothryoidism, estrogen dominance, Vitamin D deficiency, and I actually do not have elevated thryoid antibodies. But I didn’t do well on the very small dose of levothryoxine I took and my endo thinks I should just give up on it since my TSH is 4.5! Ridicoulous idea because I am very symptomatic. I’d like to know if you ever treated patients with an unusual reaction to levothryoxine. I am one of the unlucky ones who has the rare side effect. My endo agreed to switching my meds from the generic to the brand Synthroid, and if I still get the side effects then she refused to precribe Armour because she doesn’t trust anything that is naturally derived from pigs or cows. If I get my functional medical dr. to give me Armour, and I still react to that, what other meds are out there to consider that you might be aware of? Though endo brought up Tironsint, I cannot digest capsules and it is unaffordable as it isn’t covered by my insurance. Any sucesses that you may have had with other patients who can’t take levothryoxine and which alternates you saw better success with, I’d really like to hear about and I’ll ask the functional dr. what she thinks if it is possibly right for my situation. THANKS!!!!!!!!!! Lilac – thank you so much for sharing your journey! I am so happy to hear you are taking charge of your health! <3 There are quite a few options for thyroid medications. In my experience, what works for one person may not work for another. If your doctor will not prescribe the medication which you are looking for, ask your local pharmacist for doctors in your area who prescribe the medication you are looking to try. Have you read these articles? In the shade, in summer I suffocate, I can not breathe, I’m faint, I can not do my daily activities. I can not stay in the sun. What do you recommend? Diagnosis: autoimmune thyroiditis, ischemic cardiopathy, angina pectoris unstable.